Like a mouse in a maze, I wandered the back streets of Vico del Gargano. Every narrow, twisted alley I encountered, my eyes opened a little wider. In years I was 37, but in spirit I was a little kid again. I knew nothing of Vico del Gargano upon arrival, yet it was as though everything I expected of Italy was suddenly before me. The mundane was fascinating. The colorful doorways became the focus of my attention. 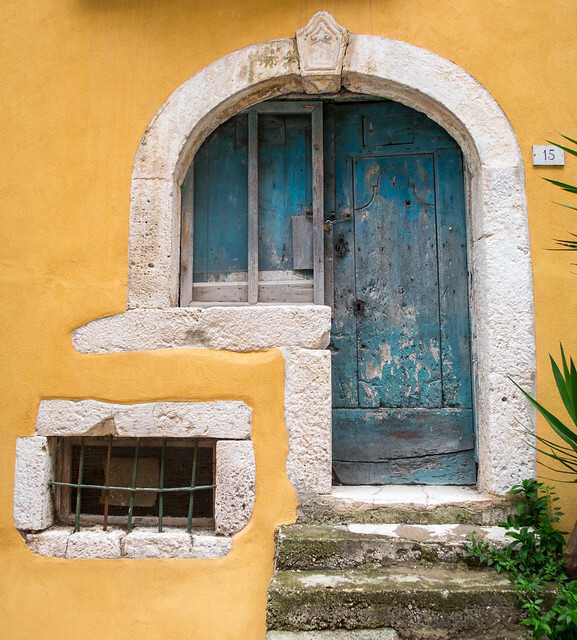 I have a thing for painted wooden doors and ornate archways, and Vico was full of them, adding splashes of color to the otherwise ancient stone facades. Looking up, laundry lines hung from windows. 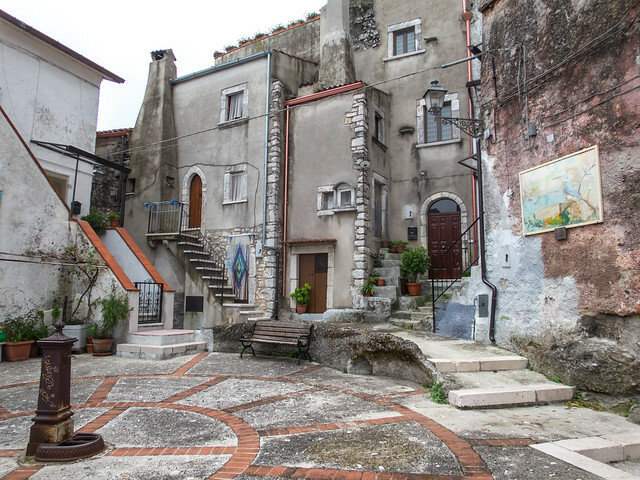 Vico del Gargano is known as the “Village of Love” and wandering the old center, it wasn't hard to see why. One alley in particular, Vicolo del Bacio (“Alley of the Kiss”) is entered through a 30-foot tunnel, barely wide enough to fit a single person. Given the close confines, legend has it that whoever you enter the alley with you'll end up kissing. 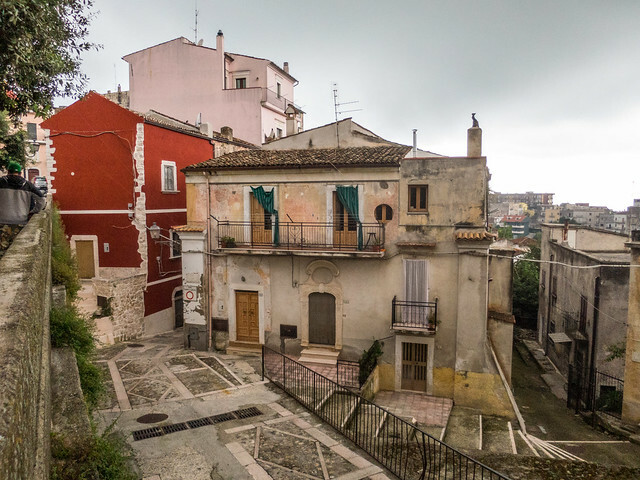 I imagine every guy in Vico takes his first date through Vicolo del Bacio. Upon exiting the covered section, you're treated to a small enclosed plaza on the lefthand side. 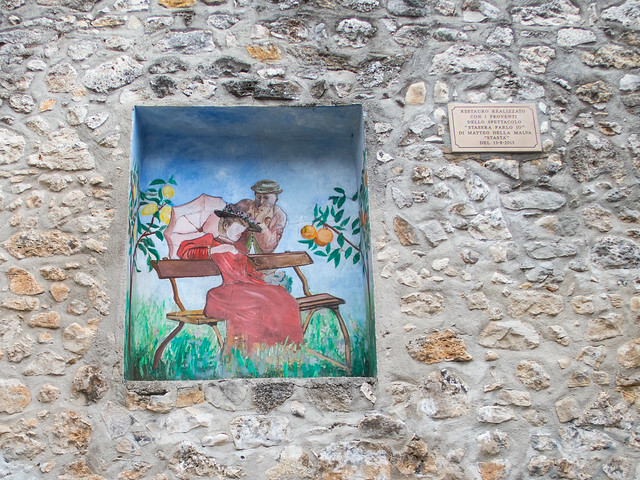 A romantic scene featuring a seated woman and a male suitor is painted into a niche in the wall. A nearby plaque indicates the painting was restored August 13, 2013. It was a Thursday morning, and there were few residents to be seen. An old Italian woman, surely someone's grandmother, stood in her doorway dressed in black, watching me and my fellow bloggers. She was kind and patient and willing to pose for photos despite the language barrier. A few small sculptures lead my attention to a doorway. Above it was an old wooden sign with “Mastro” (Master) etched into it. 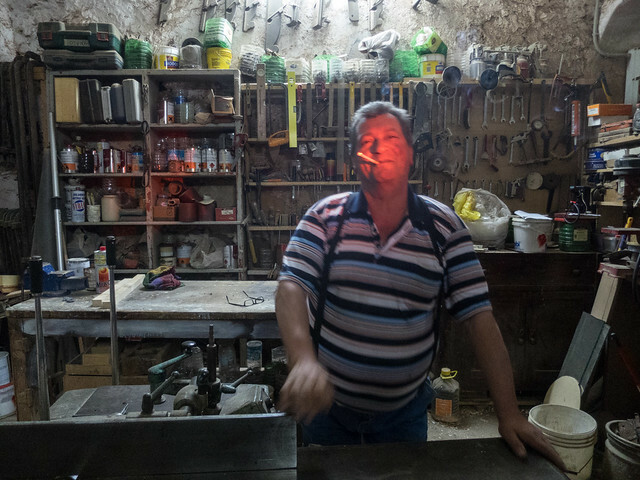 I entered the door to find myself in the middle of the craftsman's workshop. He stood before me with a lit cigarette and a smile. He encouraged us to come in and look around. I continued through the workshop and up a staircase filled with old photos and a large phonograph. Exiting the other side, I was now back near the start of where the walk began. A Norman castle loomed large, though there wouldn't be time to explore it. A few us of took a bathroom and coffee break at Manita Cafe. 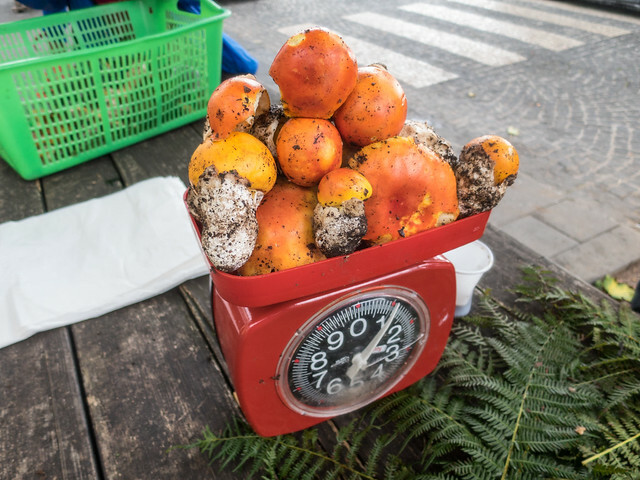 Nearby, a street vendor was selling the most colorful mushrooms I'd ever seen. Once our group had reunited, we entered Museo Trappeto Maratea, an old underground olive mill built inside a natural grotto. Opened in 1317 and used as a working mill until the 1950s, it now fills the role of Gargano's agricultural museum. Entrance is free, so there's no reason not to visit. 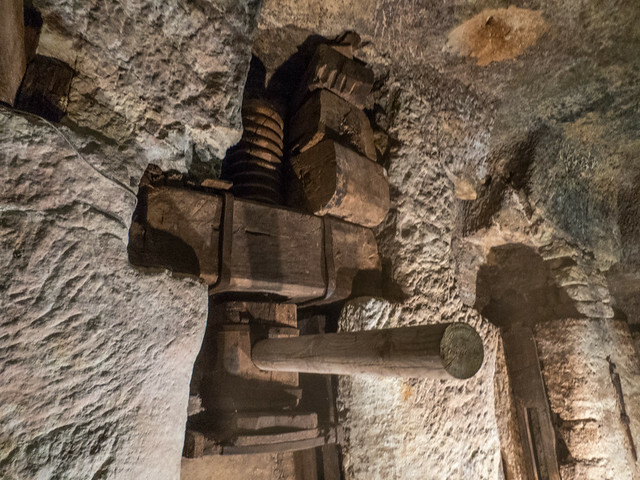 The most impressive feature was the giant wooden presses built into the limestone walls. The rest of the grotto showcased old agricultural tools and machines. 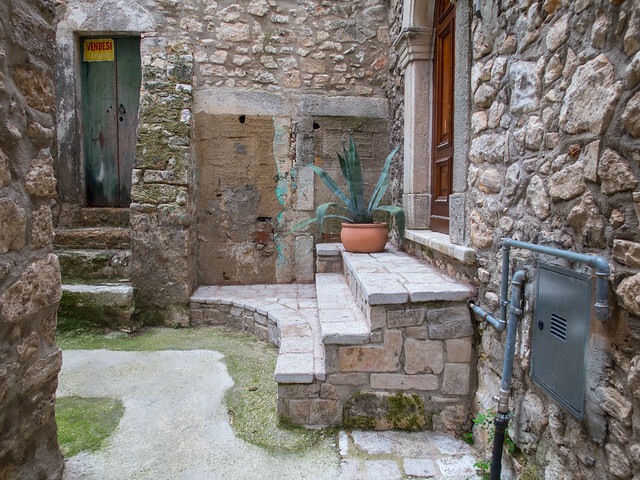 To leave the mill, we climbed the stairs to find the rain from the day before in Monte Sant'Angelo had returned. I felt grateful for the few hours we had to get lost in Vico del Gargano, a village stuck in time, which had captured my imagination and reminded me of what it's like to be a kid again. As we drove away in the pouring rain, all I could think about was opportunity to continue exploring villages like Vico.